Posted by cristobalgomez in Uncategorized. The Federation of Jewish Communities in Spain (FCJE) and Movement against Intolerance warned this Wednesday that in recent years there has been an “extraordinary” and “dangerous” growth of antisemitism in our country. In a press conference to present the Report on Antisemitism in Spain during 2010, Jacobo Israel, president of the FCJE, and Esteban Ibarra, president of the Movement against Intolerance, warned especially about the racist and xenophobic expressions spread via Internet. “What is illegal in the press is not illegal on the Internet,” Jacobo Israel condemned. Jacobo Israel and Esteban Ibarra have explained that is impossible to account in numerical form for the growth of Antisemitic acts and opinions in recent years, as much because many are not reported and because they are enveloped in a general concept of xenophobia and not extracted. 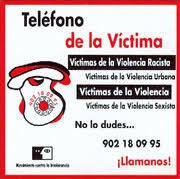 Ibarra has affirmed that each year there are some 4,000 racist incidents in Spain. If one were to extrapolate from what occurs in the rest of Europe, where “10% of this incidents have a clearly Antisemitic character,” it could be said, the president of the NGO has confirmed, that “nearly 400 Antisemitic incidents” take place each year in our country. Jacobo Israel referred to the survey carried out by Casa Sefarad last year, in which 34.6% of those surveyed by the Institute commissioned by the Ministry of Foreign Affairs were shown to have an “unfavorable opinion” of Jews. There is no other similar survey in our country, so we cannot compare the evolution of opinions against Jews. “The economic crisis is encouraging racism, xenophobia, antisemitism, and Islamophobia,” Esteban Ibarra explained. Ibarra has said as well that “Spain is not fulfilling its tasks regarded the fight against antisemitism.” He as well as Jacobo Israel has petitioned for a reform of the Penal Code, as mandated by the EU, so that websites with xenophobic content can be shut down. They have also demanded that there be Public Prosecutors specializing in hate crimes and antisemitism in all the autonomous community (currently they only exist in the provincial courts of Madrid and Barcelona).